Welcome to the Coaticook Valley! Generous rolling hills, rich and fertile valleys. Proud and creative inhabitants. Living history and heritage around every corner. Starry nights where dreams abound. Taste all the delicious regional products. Enjoy the pace of life of a true country region! Here you can taste the exclusive flavours of the famous Coaticook ice cream; walk across the longest suspended pedestrian footbridge in North America; hurtle down mountain bike trails; visit the most modern fish farm in North America; taste unique, original regional products such as “croustipom” (apple chips), a cassis aperitif, high quality artisanal cheeses and many other tasty creations. Many other wonderful discoveries await you. In the heart of the Eastern Townships, the Coaticook Valley has more than enough to please you! Located at the heart of the Eastern Townships, the Coaticook Valley is a real crowd-pleaser. Home to a variety of activities, this place specializes in unforgettable experiences. Outdoorsy types will love exploring the forests and going hiking, fishing and swimming. If food is your passion, taste homemade and locally produced delicacies at farms and markets. When it’s time to turn in for the night, B&Bs, inns, campsites, yurts and even fully equipped trailers provide ideal accommodations. Wishing you a magical stay! To learn more, click here. 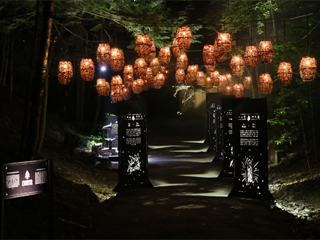 Do not miss the new event, laFête de la Magie Coaticook (the festival of magic - in French only). You can buy online tickets here.